A distinguished jury has selected the winning design in the seventh annual City of Dreams Pavilion Competition: Cast & Place by Team Aesop (Josh Draper from PrePost/RPI-CASE, Lisa Ramsburg and Powell Draper from Schlaich Bergermann Partner, Edward M. Segal from Hofstra University, and Max Dowd from Cooper Union). This temporary pavilion will be assembled on Governors Island and open to the public for the summer 2017 season. FIGMENT's Artist-Designed Miniature Golf Course is scheduled to return in June for its tenth annual summer-long season! Each season, new holes are designed, constructed and installed on Governors Island by emerging and established artists. Free to play and open to the public, The Minigolf Course is enjoyed by thousands of happy children and adults throughout the summer including players from school and camp groups from underserved communities. Their smiles and laughter are one of the biggest rewards for supporting the Artist-Designed Minigolf Course. We are excited to announce the launch of our Kickstarter campaign, which was created to help defray the rising costs of building, maintaining, insuring and staffing the course. Learn about the special opportunities for supporters including club memberships, construction of custom-designed holes, and team slots in the first ever Governors Island Miniature Golf Masters Tournament! 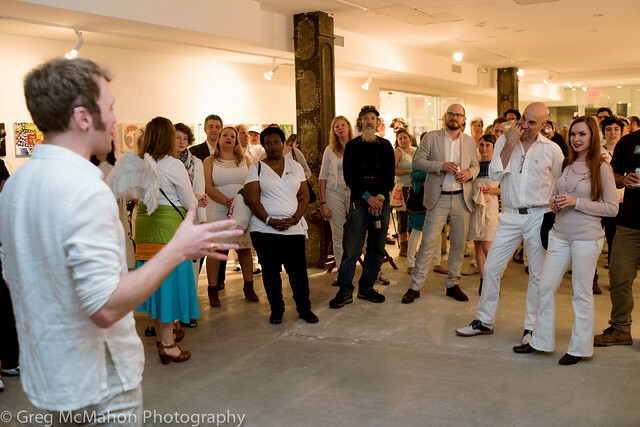 Photos are in from the Art in Action 12"x12" Fundraiser! Check out these beautiful photos taken by Greg McMahon at our Fundraiser May 3rd. George, one of our producers, gives a talk to the partygoers. 2016 Weekend Project Submissions are NOW OPEN! We are excited to announce that we are now accepting art project submissions for the FIGMENT NYC 2015 Weekend!